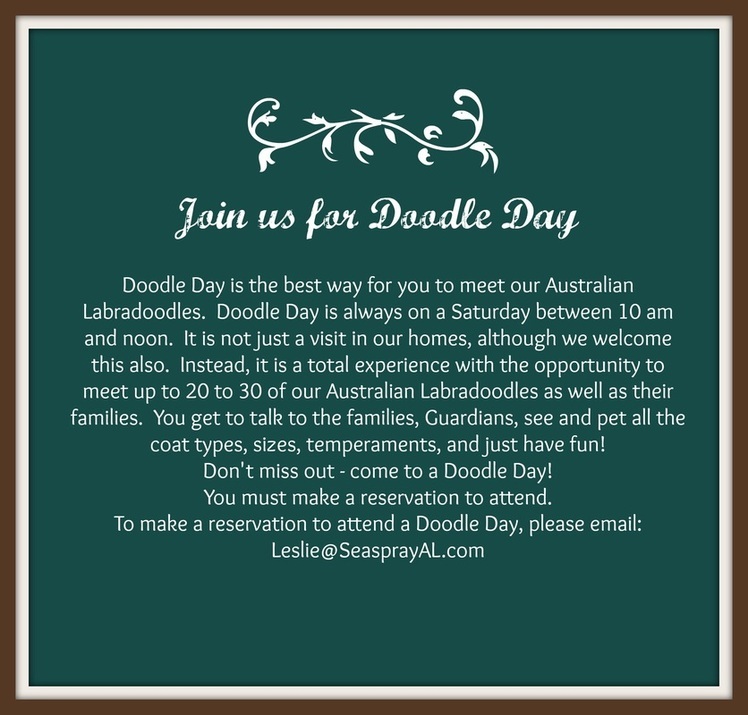 Families often ask to visit Seaspray and meet our dogs. There is no easy response to this request because we understand your desire to see, first hand, where our dogs are housed and how they are cared for. We know that you would like to meet the puppies before you bring one home to become part of your families. We are very cautious about the health of our puppies and visitation is regulated. Every visitor has the potential to bring some form of bacteria or virus that might threaten our young puppies. We are particularly concerned about the deadly Parvovirus. With these things in mind, we have tried to incorporate a policy that addresses your desire to visit while still protecting our precious puppies from life-threatening disease. If you have placed a deposit on a puppy, you will be asked to meet that puppy at some point before you bring him home. This visitation usually takes place when the puppies are 6 to 7 weeks old. There are procedures you must follow to help protect the health and welfare of our puppies. Newborn puppies have no immunity to disease, and access will be carefully done. We will certainly provide pictures, information and references. We will set up a webcam so that you are able to see your puppy in real time and see how your puppy interacts with us and how and where it is cared for. If you wish to meet some of the adult dogs, we may be able to arrange to meet you at a convenient location. Not all of our guardian dogs are available for you to meet as they belong to families and are taken on vacations or the families have conflict with schedule times but we do try to schedule a time for you to meet. Our dogs live in the same home as our family or they live with guardian families. They are not kept in kennels or commercial facilities. They enjoy temperature control, human and canine interaction, constant attention and supervision. Our adult dogs and puppies have routine vet care, worming, vaccinations and wellness checkups. Our dogs are given free access to the home and property. We use crates to confine them only during training and when necessary for their safety and well-being and only for brief periods. Many of our breeding dogs live with families in guardian homes. These homes provide the dog with personal love and attention and allow our program to grow while still giving our dogs the benefit of being raised in a home, in personal family units. Seaspray dogs live “in the real world” and are not always coiffed and quiet, they get plenty of exercise, they play and dig in dirt and grasses; they chase each other, run after toys and play ball. They sometimes swim in the pool. AND they all cuddle on the bed with us every night. The welfare of our puppies is our highest priority.